The best way to describe what Moghrabieh are would be to say that they’re Lebanese couscous. Much larger in size than regular couscous and larger still than Israeli couscous, these pearl like buttons are made from semolina flour and have the consistency and texture between a gnocchi and a dumpling, with a slight chewy bite to them. 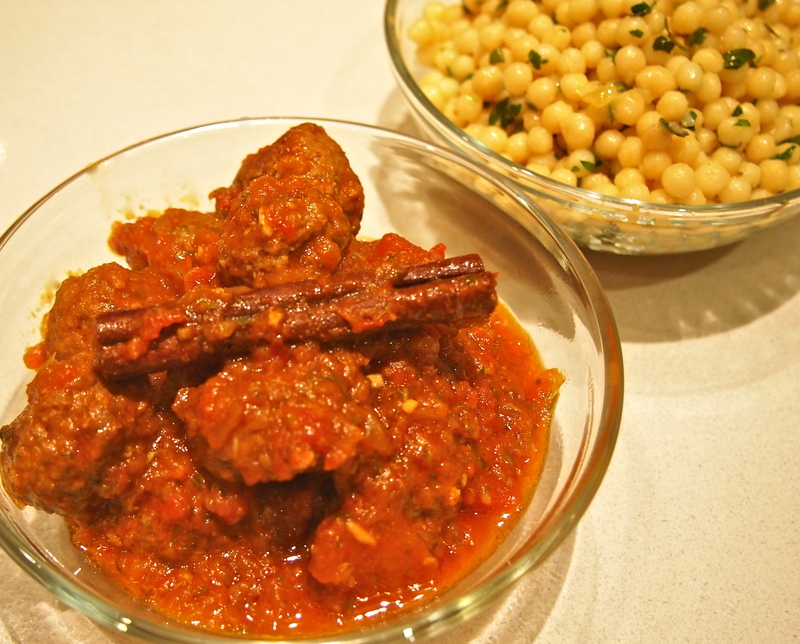 The meatballs are full of flavour and the tomato based sauce is spiked with lots of Moroccan spices. 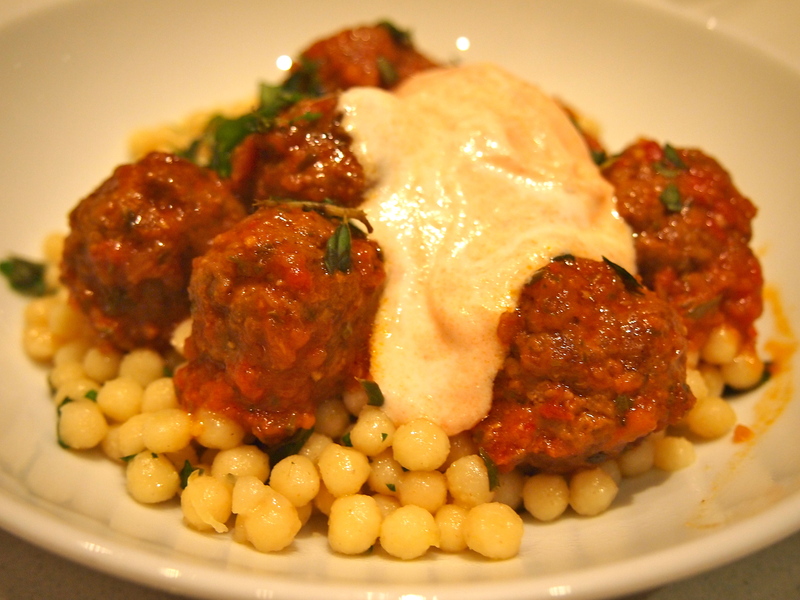 The meatballs can also be served with rice or regular couscous. Put all the chermoula ingredients into a mini food processor and blend to a smooth paste (or grind in a pestle and mortar). Set aside. 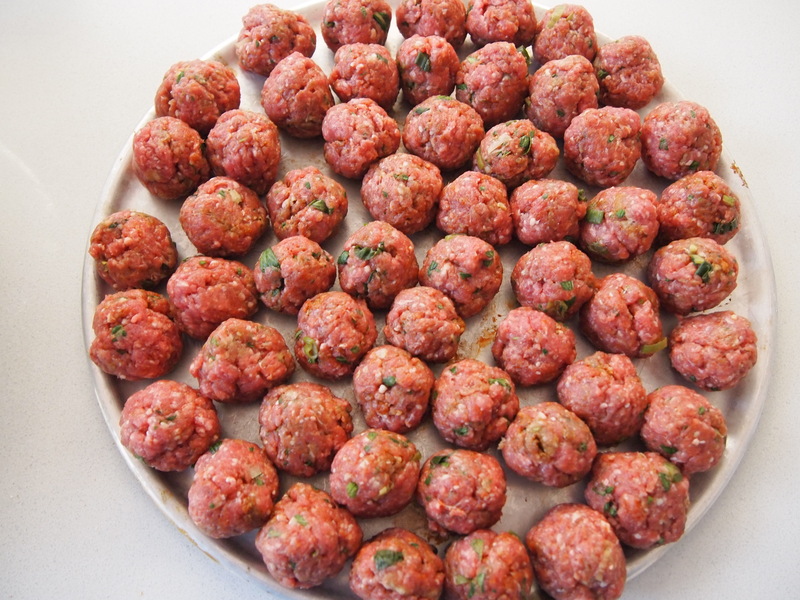 For the meatballs, put the mince into a bowl with the crushed garlic, cumin and coriander seeds, paprika, chopped mint, salt and some freshly ground black pepper. Mix well with your hands, then shape into 2.5cm balls (about 35g each) with lightly oiled hands. 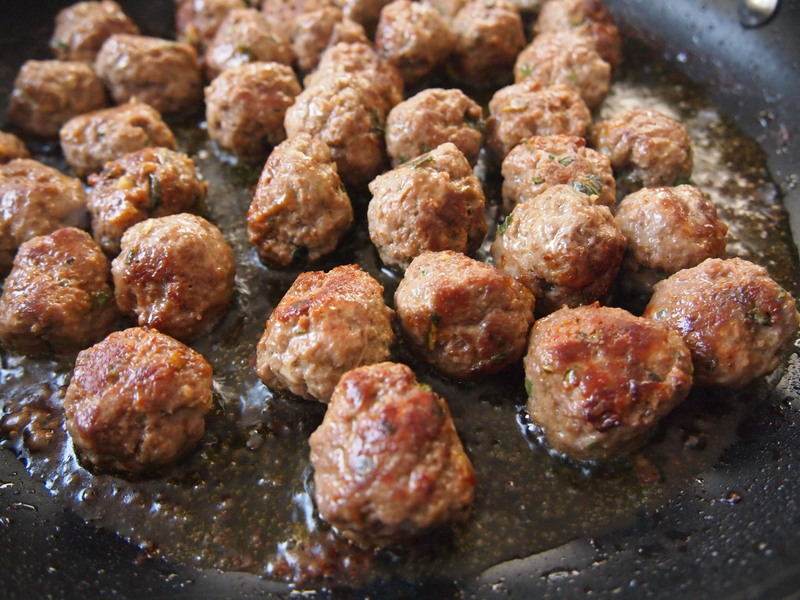 Heat 2 tbsp of the olive oil in a small flameproof casserole or large saucepan, add the meatballs and fry briefly on all sides until lightly browned (about 5 minutes). Remove with a slotted spoon to a plate. Add the remaining oil (if needed), chopped onions and cinnamon sticks to the oil left in the pan and fry gently for 6-7 minutes until the onion is soft and lightly golden. Stir in the grated ginger and turmeric and fry for a few more minutes. Add the tomatoes, honey, stock and 2 tbsp of the chermoula, then bring to a simmer. 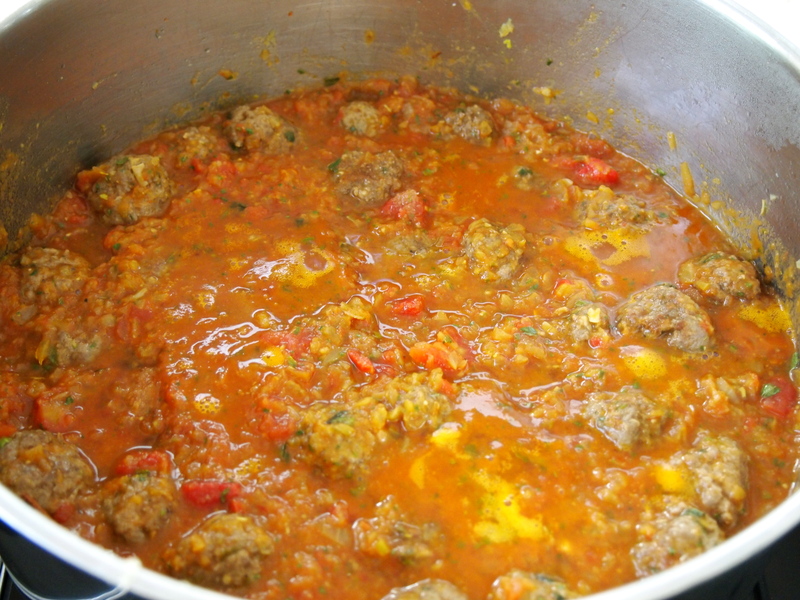 Drop the meatballs into the sauce, part-cover with a lid, then simmer on very low heat for 40 minutes, stirring now and then, until the sauce has reduced and thickened nicely. Take a few tablespoons of the sauce and whip it into the greek yogurt, set aside. Stir in the remaining chermoula to the meatballs, season, scatter with the shredded mint leaves and serve toped with some of the yogurt mixture. To make the Moghrabieh, heat olive oil in a large saucepan and sauté onions and garlic until soft but not browned. Boil water in a large saucepan. Cook moghrabieh for 5 minutes then drain. Add moghrabieh to onion mixture, add stock and bring to the boil. Reduce heat and simmer for 15 minutes, stirring regularly. 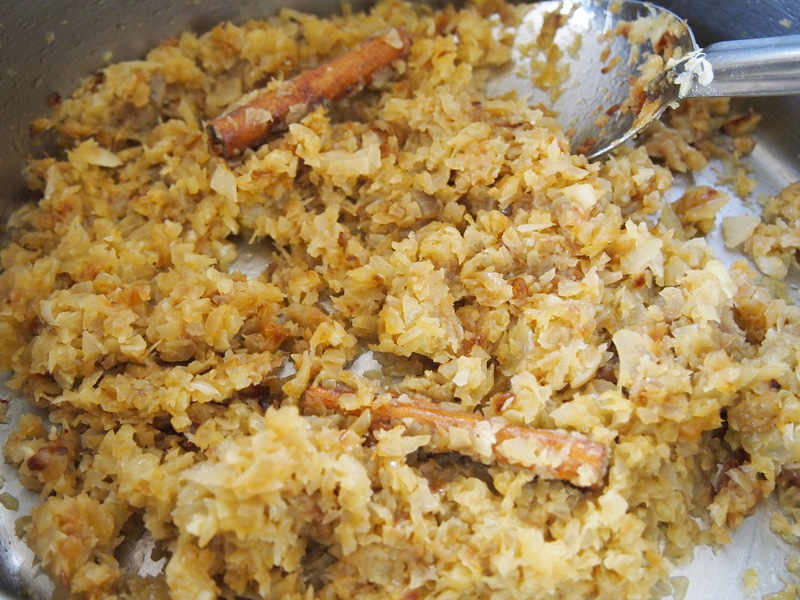 The moghrabieh should become tender and most of the liquid should be absorbed. Stir through butter, herbs and lemon juice.